Perfect for artists who want to max out their productivity and enhance their quality of work without sacrificing portability and convenience. Is your airbrush compressor holding you back? Overheating? Inconsistent? Let the Iwata HAMMER HEAD SHARK Airbrush COMPRESSOR change all of that. Thanks to new technology and design innovations, the airbrush compressor keeps its cool. It includes numerous cooling features, such as an efficient fan, a long, reinforced power cord, and moisture filter. 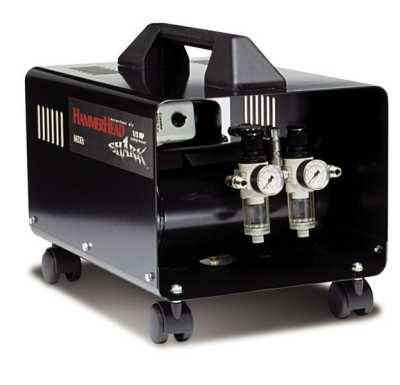 The airbrush compressor is reliable, accurately holding a wide range of pressures. Its features make this airbrush compressor ideal for work in a studio setting. This Iwata airbrush compressor is capable of supporting two brushes at once, even if those brushes are running at different pressures. The compressor also boasts a carrying handle and wheels for easy transportation. Cooling Fan: The airbrush compressor has an innovative cooling fan located on top of the motor/compressor. This fan enhances the cooling efficiency of the compressor so that nothing can slow the artist down! Moisture Filter: Never worry about moisture putting a damper on airbrushing again! The air compressor comes with an advanced filter for moisture (5 microns) that is sure to prevent water from reaching the airbrush. Pressure Regulator: Inaccurate pressures can threaten the quality of airbrush performance. This compressor holds a wide range of pressures (0 - 100 PSI) accurately. This accuracy allows the attached airbrush to operate smoothly and consistently. Long Power Cord: A longer power cord means more flexibility. The airbrush compressor's 10 inch cord means that it does not have to be right on top of an outlet. A longer cord also means that an extension cord is not needed. Ultimately, not needing an extension cord solves a big overheating problem for the airbrush compressor. Wheels: This is an airbrush compressor that moves! Heavy-duty wheels make it perfectly portable for intra-studio movement. T-Shirt Artist: Functions well for a non-production/basic T-Shirt artist and will support one user. Fine Artist: Capable of running all airbrush types. Automotive: Capable of running custom airbrushes used by automotive artists. Illustrators, Ceramics & Taxidermy: Will support up to three users in a studio setting.